Drinking water is essential to staying healthy. It’s no secret that bottled water will provide you with the hydration you need, but at the cost of the waste introduced into the environment. An EPA study estimated that Americans throw away over 28 million plastic bottles each year. That’s not good. Some people try to reuse those plastic water bottles, but they don’t realize they aren’t made to be reused, and that repeated refilling, exposure to heat, and manipulation from use can cause the chemicals in their manufacture to leach into your beverage. A better way is to use a reusable water bottle. Choosing a reusable glass, stainless steel, or plastic water bottle is a responsible choice that many of us have made, but when was the last time you actually cleaned it? Even if water is all you ever put that bottle, you need to clean it. A neglected water bottle is a breeding ground for germs. The damp environment of a water bottle is the habitat bacteria crave. On the low end of the spectrum, an unclean bottle is going to make your drink taste musty. On the high end, we start talking about the spread of diseases like e. coli, salmonella, and cholera. How often should you clean it? Every day. Yup, that’s right. Many water bottles are dishwasher safe, and that is probably your easiest option. The key piece a lot of people miss is that you need to let your bottle dry completely before storing it or using it again. Put it in the cabinet or pantry while still wet, and you just undid all the disinfecting you accomplished. I’d strongly recommend getting a bottle brush to scrub the inside of your bottle. Especially if you aren’t cleaning it every day, stuff can start to grow in it and the brush will help get rid of that. I remember a time when I was using a Camelback hydration bladder during paintball games. It had a smoke colored drinking tube so as to help blend in with my camouflage. Well it did until I decided to clean the tube with a narrow brush designed for such cleaning. I then discovered the tube was clear all along and it became cloudy from neglect. Yuck! If your bottle has a straw or mouthpiece, don’t forget to sanitize those too. Be careful about putting them in the dishwasher as I’ve lost a few to the heating coil after they became dislodged from the top rack. You can toss the mouthpiece in some boiling water and run a brush with soapy water through it and the straw to make them as good as new. Other cleaning options include filling the water bottle halfway with water and adding a drop or two of dish soap and shaking. Brush it out and rinse and dry thoroughly. For a bit more aggressive cleaning and to get rid of tastes or odors, try filling it 1/5th the way with white vinegar or lemon juice and fill the rest of the way with water and allow it to sit overnight. Rinse and dry in the morning. Choose a water bottle with a wide mouth instead of a narrow one. The wider opening allows for easier cleaning and drying. Keep your water bottle dedicated for water only. If you need to mix something in your water, that might be an application where a disposable bottle is appropriate. Don’t share your bottle. While the bacteria in your mouth might not affect you, other people’s bacteria can make you sick. Don’t leave your bottle damp and in a dark or warm place, especially inside a hot car. The heat promotes bacteria growth and can damage your bottle. Get two bottles so one can be drying thoroughly after your cleaning while the other is in use. Even though your bottle is reusable, it has a lifespan. When it starts to peel, becomes deformed, or if it develops a chemical taste, toss it. Look for plastics that are BPA free. BPA is an additive to plastics that has been deemed hazardous. 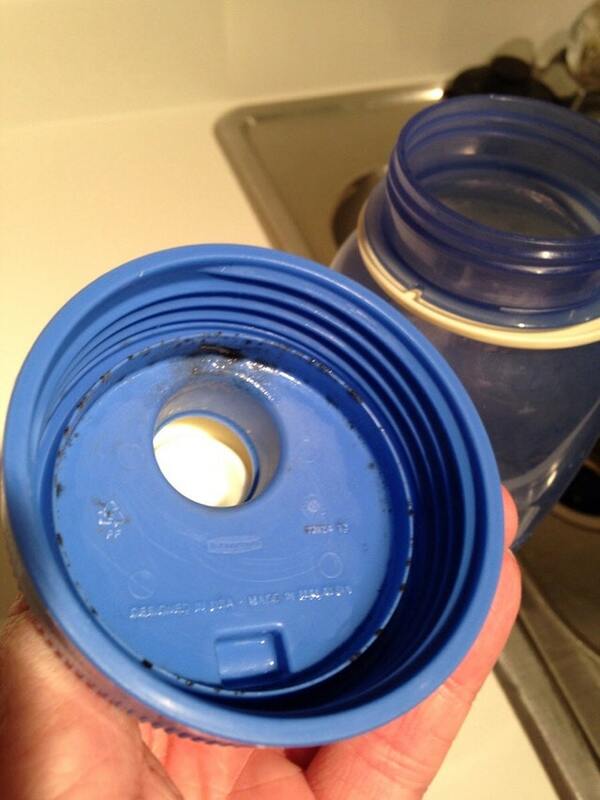 BPA free plastics should be marked as such, but in case not, avoid bottles marked with recycling codes 3 or 7. You’ve got to do it everyday. You gotta clean me the right way. …Ok, I’ll keep my day job.